Michelle has created a unique book dedicated to the formality of architecture. In her project ‘Urban Speculation’ she reimagined and reconstructed urban landscapes by collaging internet based images of Modernism architectural structures. Gevint says about the project that these new structures stand as metaphors for a failed promise. She created a place, structures that resemble a post war environment, the opposite of this utopic promise of the Modernism. The book, is a thin booklet with a very minimal look. It is clean, almost bare of design. Its yellow-ish pages with the graphic Black and White images, allow us to view the images with an analytic point of view, not an emotional one. 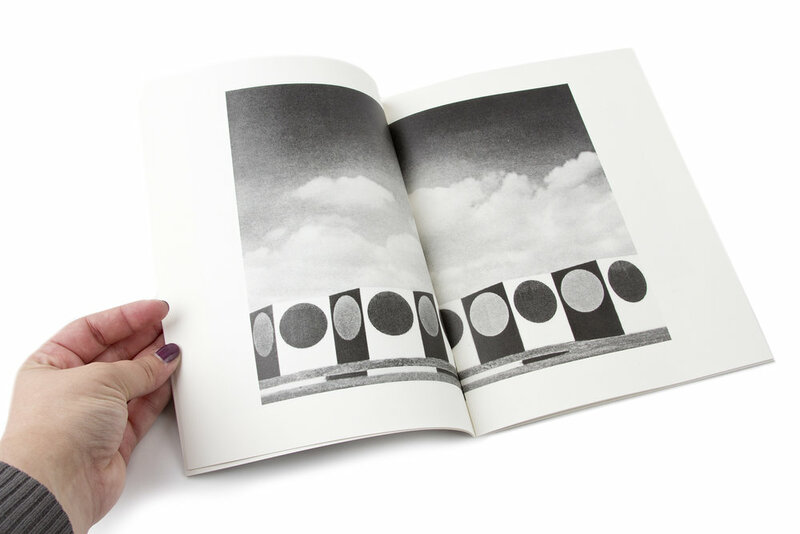 The images sit in a heavy manner inside the pages. They are formal, centered. I think what I found the most interesting is the quietness of this book. When I looked through it, I felt I had to be silent, let the structure tell me their harsh story. The smart decision of making this into a relatively small, thin booklet speaks loud to this notion of failed utopia, failed expectation. There is no glory in this book, only simple structures, lines and curves that make the project what it is. The artificial simplicity of the book, makes me think about the complexity of the project. Thinking about the statement she gave in the beginning of the book, declaring its ‘Fakeness’ and its manipulation. She is not trying to fool the viewer in to believe these places are real, but allowing us to view them with this understanding that they are not a part of our real world, yet we can read in to them from out understanding of architecture and art. The title of the book ‘Non Places’ is intriguing. These are places, as I can see them with my very eyes, yet the do not exist anywhere in the physical world. Duo to the manipulation and the Photoshop, Gevint has created her own city, place which is in fact nowhere.